Just north of bustling San Francisco, California’s premier wine region awaits ready to present world-class reds and alluring outdoor activities for the discerning traveler. Grapes ripen on the vine and temperatures are mild as the harvest sets in from late August to October, but Napa Valley is so much more than its 400 wineries. A glass of full-bodied regional Cabernet Sauvignon is just the beginning of what it has to offer — luxury hotels, decadent spas and Michelin-starred restaurants are all part of the true Napa Valley experience. Whether it’s savoring the Yountville cuisine scene, exploring charming downtown St Helena or admiring the natural beauty of Calistoga, Elite Traveler has the guide for a perfect Napa Valley getaway. 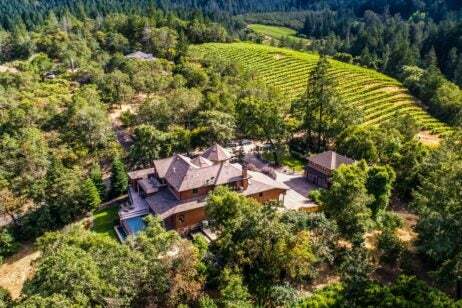 Secluded in a private canyon, Calistoga Ranch is an Upper Napa Valley sanctuary on 157 acres of picturesque hiking trails crisscrossed by flowing creeks. The 50-room luxury resort is family- and pet-friendly while maintaining the luxurious amenities associated with the region, such as fitness classes and tailor made mud treatments at the Calistoga Ranch Spa. While the on-property vineyard and farm-to-table cuisine at The Lakehouse beckon you to stay, guests can explore Napa Valley outside the resort with complimentary use of a Mercedes-Benz. 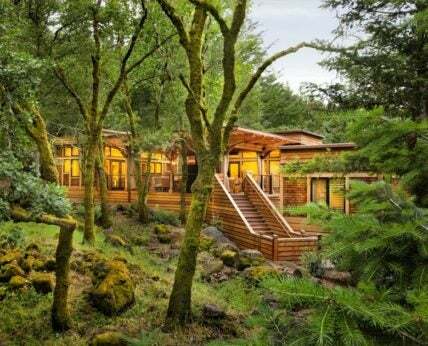 For complete privacy, pick the the 2,400 sq ft Estate Lodge, which sits peacefully within the natural brush of the Napa forest. Against a mountain backdrop, the lodge features two king-size beds, one queen sofa bed, two full bathrooms, private outdoor hot tub and concierge service. From $3,255 per night. Calistoga Ranch, Auberge Resorts Collection is located at 580 Lommel Rd, Calistoga, CA 94515. For booking and more information, please visit calistogaranch.aubergeresorts.com or contact +1 855 942 4220. In Yountville, Bardessono puts environmental initiatives at the forefront of the hotel experience without compromising on luxury. From the use of salvaged trees in the hotel’s decor to the organic products incorporated into treatments at B Spa, a stay here is as green as it is sumptuous. Savor seasonal (and eco-conscious) fare at Bardessono’s own Lucy Restaurant & Bar, or venture to Yountville’s myriad fine dining establishments in a complimentary 2015 Lexus RX 450H or 2015 Lexus GS 450H Sedan. At 750 sq ft, the Tufa Suite is an ultimate relaxation haven designed to serve as both a lavish accommodation and a private spa. 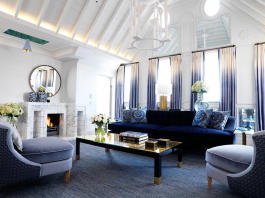 The suite comprises a king-size bed with organic linens, 200 sq ft bathroom with indoor dual shower-steam rooms, outdoor shower, fireplace and private courtyard. With a massage table and soaking tub also included, guests can enjoy personalized spa treatments in the comfort of their suite. From $1,200 per night. Bardessono is located at 6526 Yount St, Yountville, CA 94599. For booking and more information, please visit bardessono.com or contact guestservices@bardessono.com, +1 707 204 6000. Auberge du Soleil sits within a sun-soaked, 33-acre olive grove in Rutherford Hill. It encapsulates casual Californian elegance with a touch of Provencal charm. The Restaurant at Auberge du Soleil is a Michelin-starred destination in itself, with Executive Chef Robert Curry offering an exquisite six-course tasting menu accompanied by a 15,000-bottle wine list. Auberge’s Bistro Bar & Grill offers a more laid-back approach to dining with breathtaking views from a wraparound deck, perfect for sunset cocktails before tomorrow’s Purification Ritual at Auberge du Soleil Spa. Spread out over 1,800 sq ft is the expansive and exclusive Private Maison Loire. With panoramic views of Napa Valley, the Maison includes a king-size master bedroom with fireplace and sitting area, master bathroom with sculptural tub, steam shower for two, double sink, dressing vanity, walk-in closet, living room and dining area. Get in shape with your private fitness studio, or look out over the resort from a trellised terrace with French doors. Price on request. Auberge du Soleil is located at 180 Rutherford Hill Rd, Rutherford, CA 94573. For booking and more information, please visit aubergedusoleil.aubergeresorts.com or contact +1 707 963 1211. If you’d prefer your own elegant chateau to a top suite, Luxury Retreats offers Castello di Marco as the ideal Napa Valley rental home. Boasting five bedrooms and five bathrooms, this generously-sized property is tucked into Napa’s rolling hills and offers a taste of Tuscany. Castello di Marco also features a grand terrace, saltwater infinity pool, hot tub, barbecue, outdoor fireplace, living room, gourmet kitchen with breakfast nook and formal dining area for eight. From $3,500 per night. For more booking and more information, please visit luxuryretreats.com or contact +1 877 475 4183. If you can’t make the trip to Napa Valley for this year’s harvest, be sure to look out for these new luxury properties opening soon for your next trip. Set to open in late summer 2017, Vintage House at The Estate Yountville will be a modern retreat for elite Napa Valley visitors. Styled in a contemporary fashion, Vintage House overlooks the stunning Mayacama Mountain range and offers luxury accommodations like king-size Loft Suites with private balconies as well as ESPA treatments from The Spa at The Estate. Vintage House at The Estate Yountville is located at 6539 Washington Street, Yountville, CA 94599. For booking and more information, please visit vintagehouse.com or contact 707-944-1112. In Downtown Napa, Archer Hotel will begin accepting reservations for November 1, 2017. 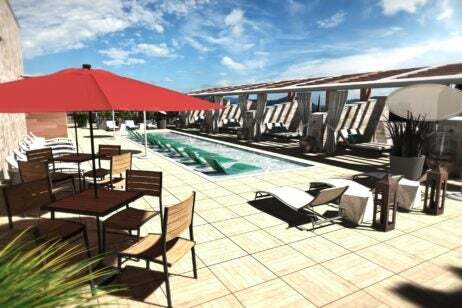 With just 183 guest rooms, the luxury boutique hotel will include refined Archer’s Dens with private balconies, fireplaces, massage tables and sleek wood accents. Dining on the property will be done at a Charlie Palmer Steak outpost, though the property is just is a stone’s throw from the area’s many restaurants, shops and live entertainment venues. Archer Hotel Napa is located at 1230 1st Street, Napa, CA 94559. For booking and more information, please visit archerhotel.com or contact napa@archerhotel.com, +1 707 690 9800. 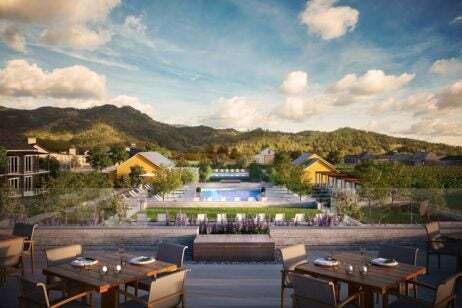 Looking ahead to 2019, Four Seasons will open a Four Seasons Calistoga Resort and Private Residences on the northern end of Napa Valley off Silverado Trail. Plans reveal a winery and vineyard producing Cabernet Sauvignon onsite as well as 20 private villas with two full master bedrooms and private terraces overlooking California wine country. Four Seasons Resort & Private Residences Napa Valley is located at 1334-B Lincoln Avenue, Calistoga, CA 94515. For booking and more information, please visit napaluxuryliving.com or contact +1 707 637 6123.